When designing five bathrooms at the same time for one house, the goal is for them to look like siblings or super close cousins…but not twins. (No offense to twins…we have three sets in our close extended family, and regardless of that “identical” label, they are never “identical” and are full of their own personality despite perhaps looking similar.) To add to the challenge here, I’m not designing only five bathrooms…I’m designing TEN (two plans for each) for this whole “I Design, You Decide” program…isn’t that hilarious??? How do you do this? Well, that is a post that we are working on because I learned SO MUCH throughout the process and I want to share it in the best blog post ever full of process and resources. Meanwhile, I’ve been given the fun news from my contractor that if materials don’t get here ASAP, they are essentially at a standstill with nothing to do and they’ll start another job until materials are on site. We ordered plumbing months ago so all the rough is in, but as far as finishes? We (you and I) are tackling those this week. 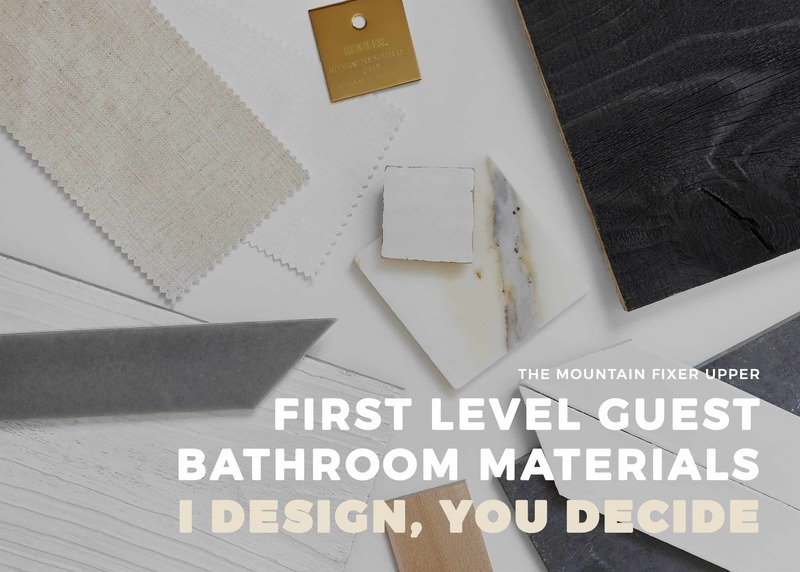 You’ll see full rendered plans for each bathroom with all the fixtures and where they are going to live soon, but for now, we need to order our materials to keep the project going, sans the renderings, mirrors or hardware. It’s like talking about “half twins,” which doesn’t even equal “one” full person…it’s just half of two people. Fifty extra “Vacay Giveaway” entry points for actually following this analogy. I just lost, but it’s my cabin so I don’t need to win a week there anyway. 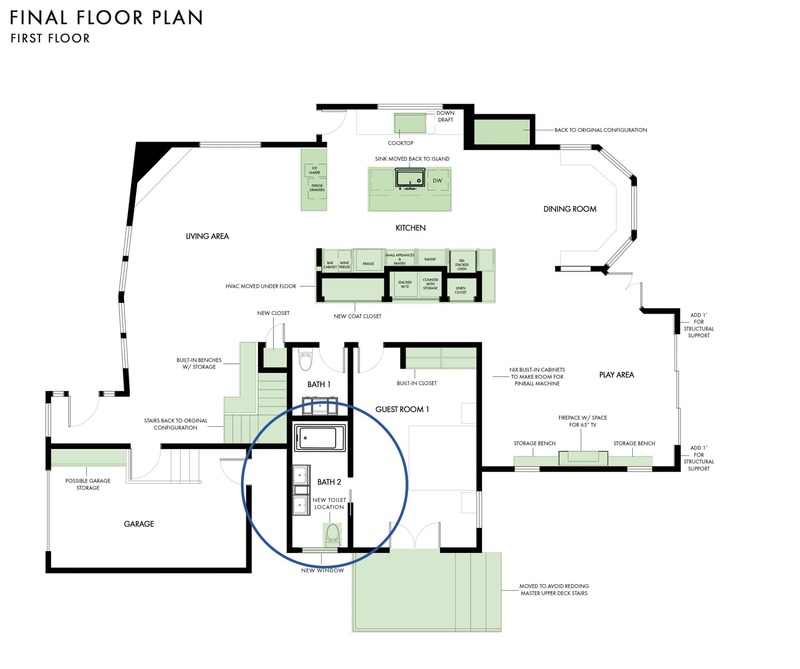 It’s tucked away so it will likely not be a bathroom the kids use and is really just for guests (its location is circled in the below floor plan, for reference). 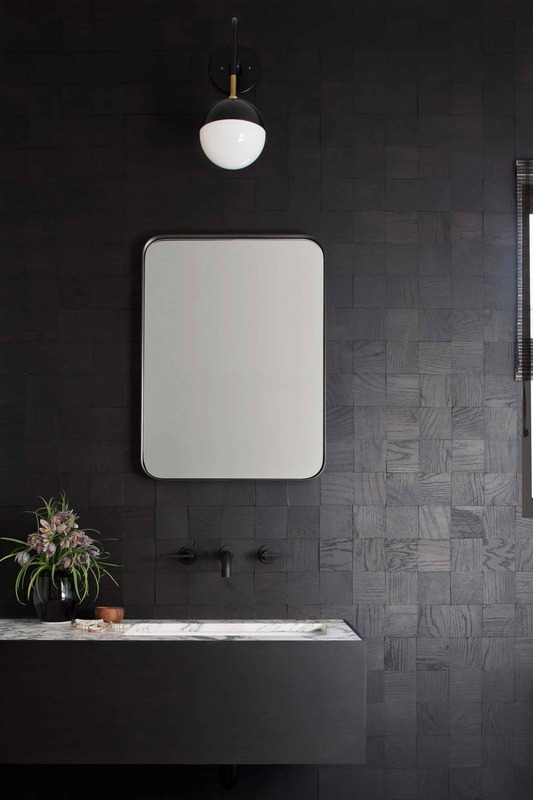 You’ve already chosen the design of the master (which is the most substantial) but we have four others to play with which means maybe it’s time to have a warm, modern BLACK bathroom. Unlike this space, our wood would go vertically and again, it’s stain reclaimed wood so it has way more texture than shiplap. We also have a new huge window with a wood frame going in and the tub surround and floor will be white tile. That bathroom, above, is too cold for this house but we would have more wood texture, a lot of warm marble and brass fixtures. This is actually what I’m afraid it would turn out to be, not that I don’t like it because I do but it won’t feel like the rest of the house. I would LOVE the above bathroom but again, that is a different house. We don’t have concrete floors or a big wood slab vanity. It’s stunning but more tonal than we are planning. I LOVE the above bathroom very much. The trick is making sure that it’s NOT this super high contrast stark-black-and-white, so adding a warm tone and having handmade tile is crucial. Shower Surround Tile: It’s hard to show you how pretty and simple this tile is. The edges have the perfect amount of “shakiness” as it is handmade (in Portland). It’s called the “Portland finish” because they actually glaze it on the opposite side giving it a sharper edge which apparently a lot of people in Portland (and the world) love. We will run it horizontally inside the shower. I’m also debating this being a gray so that it’s not such a stark contrast. White Floor Tile: This tile will be a 2″ x 2″ version of the surround tile—from Pratt & Larson—and we will likely have them set very close together, with a darker non-white trim. The window (from Marvin) is currently ordered in an unfinished white oak so that we can stain or paint (or leave) however we want. I think opting for a darker walnut tone might be nice. We will go for a washed linen shower curtain versus glass panel (maybe). This might change, who knows, but when we were in there, we wanted to soften this room and bring in more of a cabin feel (plus finding a solution to the tub shower glass panel situation that is actually attractive and not functionally annoying is VERY DIFFICULT – more on that later). You scared? I am a little. I’m super excited about the materials, I just want to make sure they look good with the vanity in a rendering. 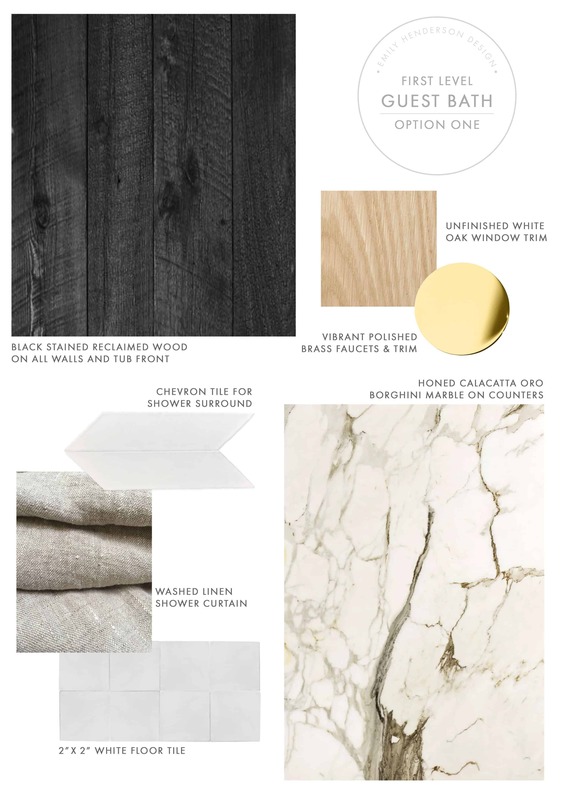 This option would still have the same theme—simple materials with lots of integrity, white reclaimed wood on the walls, and lots of grain and texture. We would use slate on the floor and bring in a different honed marble. None of these really represent exactly what I’m thinking it will look like, but it gives you the idea that it will feel brighter and lighter, probably more “Emily Henderson” but less of a risk. Shower Surround Tile: We chose the same tile on the surround but in a really beautiful greenish gray that looks amazing with the honed stone. Again, this tile doesn’t do itself justice—it’s so pretty and has a subtle handmade quality to it in person. Honed Cielo Quartzite: That stone is not one I’m typically drawn to but when it’s honed, it feels really humble and mountain-y (the photo of it here shows it in a polish finish because they didn’t have a honed sample, but picture it a little more subtle). We would use it on the counter, possibly backsplash and tub surround. Oh, and if you guys are worried about the wood on the tub front, don’t be. We will build it so that it has a ledge (unlike in my kids’ bath at our house). I would also generally not put wood in a kids’ bath, but this bath won’t be used that much and rarely by toddlers so I’m not that concerned. Slate Floor Tile: I love the idea of a dark floor to keep it consistent with the rest of the house, which has a lot of hits of black in the form of wood or stone. I reserve the right to change this to a handmade black tile if when we get these all together it looks generic. Slate is tricky because it can come off builder-grade fast, so we want to make sure that it looks special and has a lot of movement. We plan on using dark grout so it’s more seamless. For this version, I might stain the window a darker wood tone, and a glass shower door could work better, but I’m still kinda loving the idea of a really soft beautiful washed linen curtain to help bring down all the hard surfaces. It’s up to you: Should we attempt a dark wood-clad bathroom or stay safe with the lighter wood-clad version? You VOTE. I love your bright clean happy spaces. They inspired my home decor. But I feel like you need to put down the blue/white/pink color palette and back slowly away. 😁 You have an amazing eye. I trust your design sensibilities and respect how you combine hard work with humor to bring rooms to life. So trust yourself as you try the darker side of Emily. You’ll make it work. I voted for the black option, but I will say I don’t like the idea of the white vanity with it. 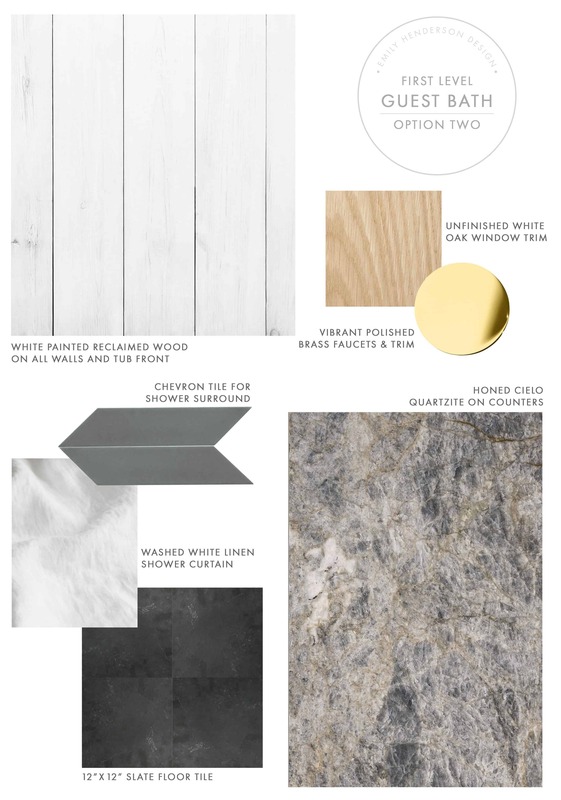 In fact, I don’t think I white vanity reads very “mountain house” in any design…even in the white bathroom option, wouldn’t something warmer or wood toned be better? But, it’s on site, so I’m sure you’ll figure out how to make it work with whichever design is picked! Also, I realize the “black” is the basis of the first design you’re proposing above, but you obviously control how much and where that wood is applied. If it feels too “not you” to have the walls totally clad in black, then scale that component back! Or have you considered a different colored stain? Perhaps not navy (although I’m sure that would be beautiful), but maybe a very dark green that’s almost black? That hint of color could make you feel more comfortable with the design? I agree, I voted for the black but don’t like the idea of the white vanity – is it really too late to change it? Is it a Kohler vanity? Aren’t they sponsors for this project? It seems like they would swap it out for you, on a rush too. Love the black wood and calacatta. It’s going to be a stunner. ha. no … the vanities are custom and its on site. now we can paint it ….. and likely will paint this one a super dark color. Dark and moody! Black walls! I want this look in my own home, so I am really curious too see how you pull it off, especially with the “limitations” of the vanity. I know it will be beautiful! I voted for Option 2, the light option, because I love the countertop, like the larger floor tiles, and like the shower curtain better to boot. I like the dark wood in Option 1, but a 2×2” floor tile seems really odd to me, and the countertop seems like something I’ve seen used a lot before. totally agree with the above comment that a guest bath is the perfect place for something unexpected! Like hotel bathroom can get away with being a little loud and daring. Option one by far. I don’t like the stone for the counters in option #2 AT ALL. And I love the dark and moody feel of the black reclaimed wood in #1. I LOVE the dark wood but personal experience tells me the white floor tile is a bad idea. I never, ever felt they looked clean enough. I’d go for the wood floor effect, which also warms it up, as you suggested. I like the thought of the wood floor also. It’ll be just the thing with the black and white. #1 baby!!! I’m really drawn to the moody darker-walled bathroom with warm touches and textures; it keeps me looking. A bathroom that is tucked out of the way a bit is a great opportunity to have fun and take a risk and try something less expected. I love the idea of seeing how you might go this direction and bring your own warmth and polish and perspective to it. It also looks comfortable and moody and fun to be in (and probably fun to photograph). ooh maybe this is the chance to paint something a warm tone? we never do that. we always do a cool tone, but i’ll try a camel or mustard in the rendering and see how it looks (don’t worry, i’ll show you). blaaaaaack ! oh my, it will be so special + it’s interesting to see you deal with a “too white/too starck” vanity as it is often what big stores only have in stock … let the transformation begiiiiin ! Love, love, love the first black wall option. Please do that. Probably not loving the white vanity so maybe paint or clad would have my vote. 5 bathrooms? Definitely go for the drama and something different! Please, please don’t do wood on the bath panel – you will regret it! It will over time get damaged by the water and retain moisture causing mold. I know this from personal experience. It looked great in the beginning and now just drives me crazy. I love the idea of mixing things up and going more moody with the black. 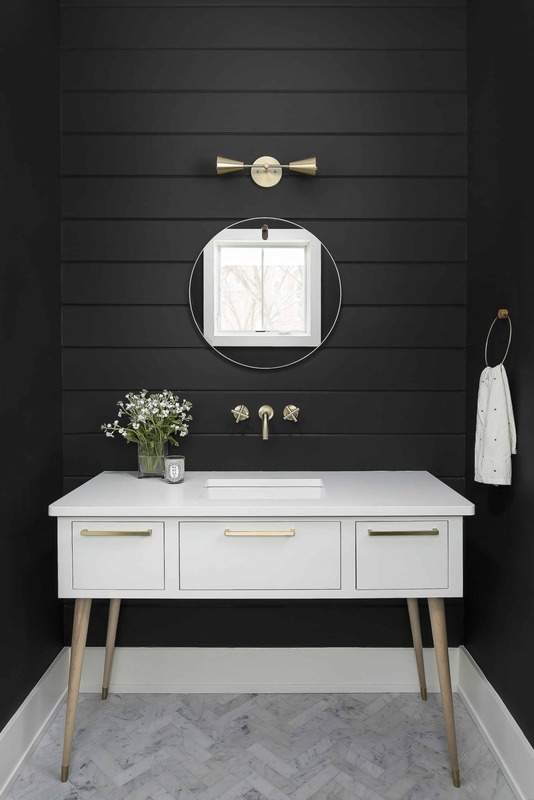 That being said, I totally understand the concern with the white vanity paired with all of the other elements and feel that a wood tone would work better. Can that vanity be re-purposed elsewhere and a new one purchased for this space? Or could it be distressed/refinished to make it less stark? Either way I know you’ll figure it out and it will be gorgeous! You are so gifted! Go dark!! I pooh-poohed your two-toned tiles, but this is something that would add so much impact without being really expensive to change. You’ve also got so many other bathrooms, so why not do something fun? Go moody emily! I painted a master bedroom dark blue, and I loved it. Everything looked so beautiful against it. I’m sure you can make the white vanity work. Don’t do white tile floors! It was the biggest mistake I made in my home. I have dark brown hair and I could sweep them every time I blow dry my hair….It shows everything. Cosign this. I have white floor tile in my bathroom and kitchen. It’s horrible. I’m not sure if this has already been addressed but if not, will you give us some tips/thoughts about how to make wood work in a moisture filled setting like the bathroom?? 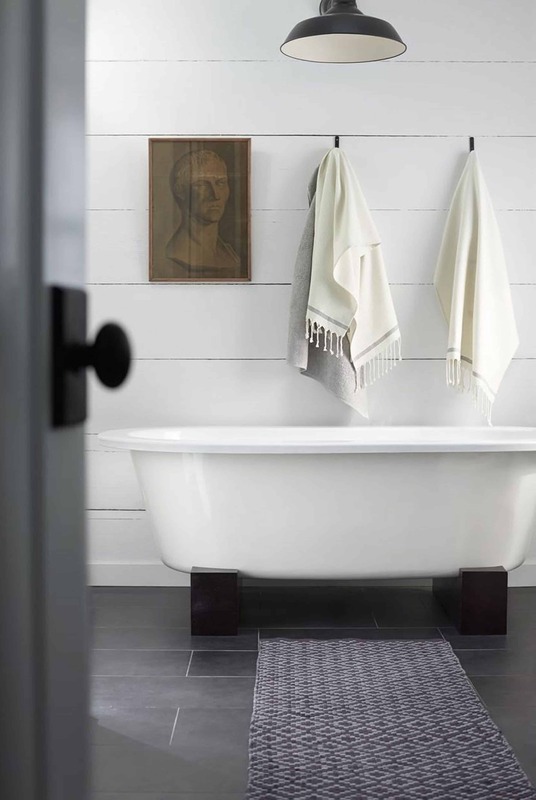 The wood paneled tub sounds/looks beautiful but I’m interested in learning more about how the wood is prepared to withstand the inevitable water it will be in contact with. Type of wood (teak for example) will handle the water beautifully, just needs to be sealed / treated every now and then. And this seems to be more like a powderroom anyway. Why not use the Ann Sacks triangle tile down here? Since Option 2 won? Feels to me like a guest bath kind of a thing:). And I like the dark wood. I mean, have fun. I am really liking the feeling of depth and warmth in Option 1. 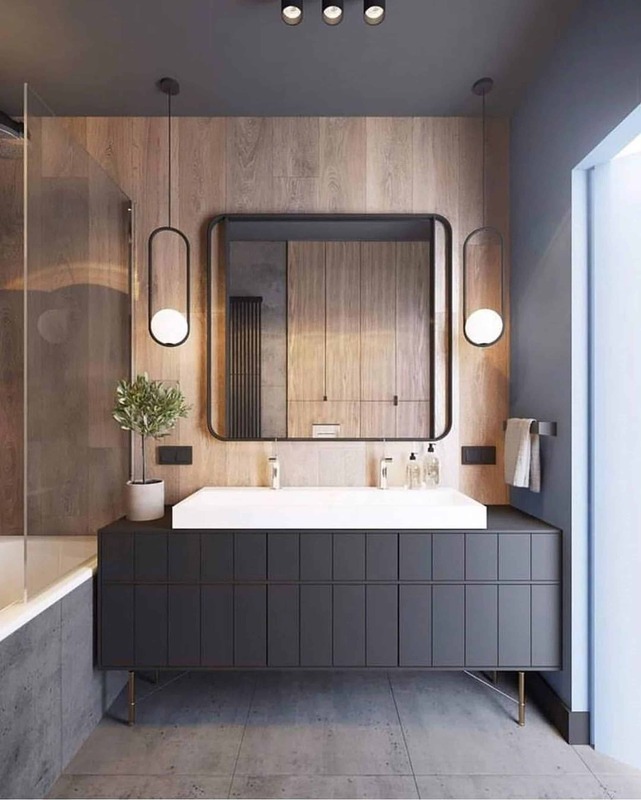 I love the idea of the floor in that gorgeous warm-toned marble and the painted vanity in particular, and perhaps the shower surround in a warm grey too… The coldness and contrast of the white tiles is actually what potentially bothers me more than the black materials. I think the black-stained wood and the warm marble are the stars in this mix and having slightly less contrast everywhere else will bring it all together. I wasn’t really excited about this scheme until I saw the additional warmer/mid-tone possibilities in scheme #1 — and now I am getting excited! I absolutely love the warm texture in the linen shower curtain too. It’s a perfect soft textural touch. I believe the “black wood paneled” tub pic is actually board-formed concrete, which shows the grain of the wood boards used to form it. It’s lovely and would probably hold up better than actual wood. I think you are right, Lesley. We thought the same thing after staring at it for a while. I’ve done some research that if there is a big enough lip on the marble the wood is fine, but i’m telling you right now that its not in our kids bath because we didn’t have a lip an because our kids splash so much. I’m debating putting a marble ‘base board’ to guard against the water. Or I could just be a normal person and not put wood in a bathroom, but its just a guest! I voted for option #1. It’s a guest bathroom. Go bold or go home. My only concern was that if the bathroom doesn’t receive much natural light then the bathroom will seem a lot more cave-like if it’s all dark. Also if the wood is burned like the Japanese technique (shou sugi ban) instead of stained it does make the wood more resistant to water. But your guys are probably doing a poly coat anyway, right? I had the same thought about the wood and burning technique (saw the rerun of the Fixer Upper with the houseboat again), and it seems like thats why they went that way. Could be a good way to seal it up… I was worried about that too. Love option 1. I think with the new window it looks like you’re adding, there will be plenty of natural light to complement the moody room. I’m voting for the black bathroom, with some important considerations. One, it seems the window is large enough to get plenty of light… important! Two, because the shower surround is white, it brightens the away-from-the-window side of the room. I was a roommate in a super pretty house once and my bathroom was papered in black with Turkish figures on it and I loved it! Its main problem was not enough light to do makeup. The small window was insufficient as was the number and wattage of the light fixtures. I do wish you were able to do a wood vanity in this room to add additional warmth…. any chance of swapping the vanity into another of your several bathrooms?? If not, I bet a raw wood mirror frame and other accents can make it work. As for the light bathroom options, just want to say I’m a big fan of that squared off marble tub edge on inspo pic #4! I voted for the black option (it is gorgeous) but think you should definitely bring that amazing marble down to the floor instead of the white tile. That marble with the black wood is a stunning combo. Your passion for option 1 is really coming through and I’m really intrigued to see how it plays out so it gets my vote! Curious, since it’s the guest bath and appears to be attached to the guest room, does that bedroom need to take on some of that dark vibe or do you see them as totally separate spaces? I love living vicariously through your remodels. And I learn so much. Thanks! I’m so excited to see this bathroom come together. Option one all the way. I don’t think the white vanity will look too stark just because you have enough variations that it won’t look to black and white. That marble has a lot of movement and some warmth to it and the window surround as well. This is going to be pretty. 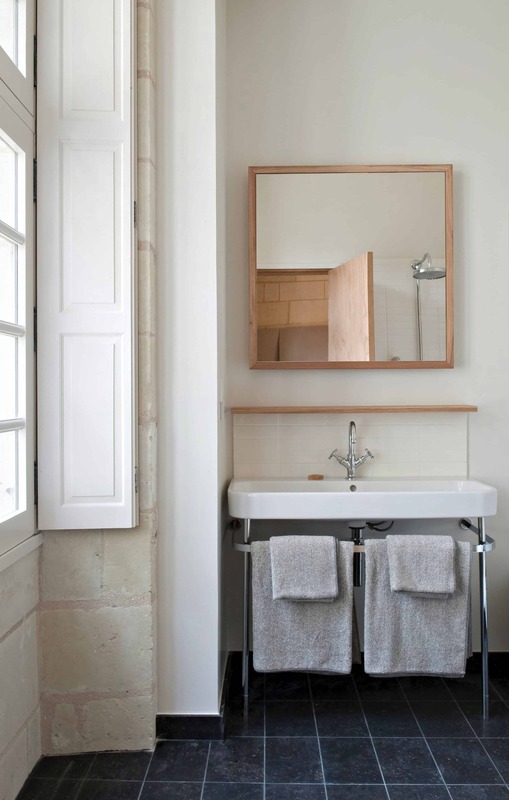 In a guest bath, people will have their toiletries in a bag or container of some sort, and will need room on top of the vanity, or a nearby shelf, to place them. Along with that factor, guests may not understand how easy it is to stain real marble or stone, so if you can get the same look with quartz or some other non-porous, forgiving surface, you’ll be thankful down the road. Both designs are pretty, but I prefer anything that is light and bright and makes it easy to see what I’m doing. Especially when it comes to razors and tweezers. I love the idea of a dark bathroom. I’ve seen a dark navy bathroom that was great. It is the perfect place to try something bold. I’m wondering if the chevron tile will feel dated soon. I feel like chevron was everywhere a few years ago and got tired. ABSOLUTELY go with the black walls! I agree that the white vanity is not the best choice, I’d try to paint it or repurpose elsewhere. I am not a huge fan of the floor tiles, mainly because I assume you’d be going with a lighter grout, and 2×2 tiles with a light grout can be a mess… I really like the idea of using the marble on the floor in big slabs since it has so much color/movement/warmth. I assume you are on it, but make sure that the wood is sealed on the bath tub since there is often puddling outside, and as a guest bath the people using it aren’t always as invested in keeping things perfect/clean/dry as you would be. While I LOVE the first option and am not scared of black walls, I vote for option 2. Option 1 screams high end modern home to me, not mountain cabin. Especially with the use of marble and brass. I think style of house, and environment, are extremely important in choosing materials. honestly, they are both beautiful but this a great opportunity for dark and moody. I vote #1 all the way. Oops! I wasn’t paying attention and I tapped the wrong button. I voted for the (very good) Option 2, but I meant to vote for the incredible Option 1- the black stained wood is amazing! You gotta do number 1 for 2 reasons – 1) that Calcutta needs to be used and loved and I need to see it being used and loved and 2) think how thrilling it’ll be to do something so different from your status quo! I’m getting more and more excited watching this unfold!! No. 2 option…I like the light and bright. It feels welcoming and peaceful. The dark option is something different, but it’s very depressing looking to me. I personally like black as accents but not wall color. I guess I’m not into moody. Now I need to see the white vanity! I didn’t even have the patience to read Option 2. I just scrolled down to vote for Option 1. This black stained wood has erased everything else that’s been on my mind today – and it was a lot! 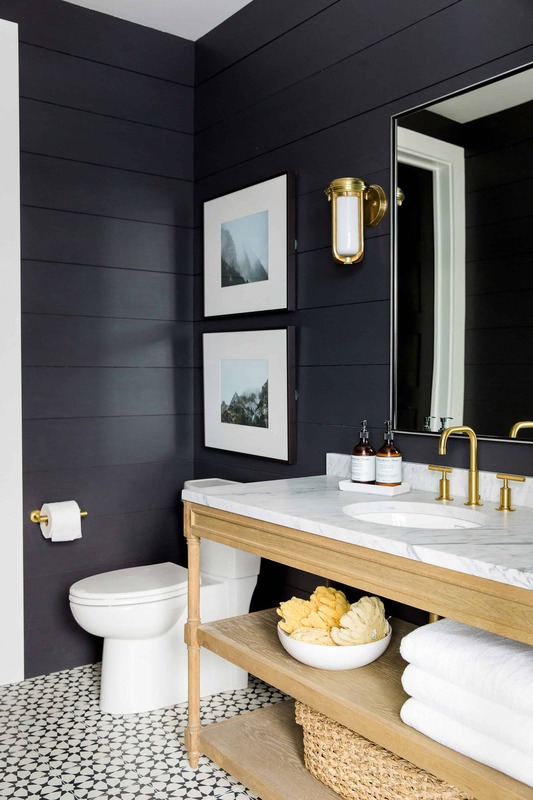 Both options are amazing and would be so great, but there is something exciting and moody about the black bathroom…and not just moody but comforting and soothing which you definitely want to offer your guests. Am I dreaming that you said it is a basement bathroom??? If so, all the better in black. Embrace the basement! My grandma’s half bath had black wallpaper with a floral pattern and it always made me feel so regal to be in there. Love the drama! I love the black slate for floors, and used it in a home we built many years ago (and still live in). To keep it from looking too “generic”, I used it just as an accent. I love a pattern, so had them cut the slate into small diamonds (about 3-4 inches), and inset into Saltillo tile. I know, I know…Saltillo is kind of “out”, but it is gorgeous with the slate diamond accents. Perhaps you could do a “tone on tone” floor…dark tiles, and the slate diamond insets. Just a thought. Would be $$, but SO beautiful! I prefer the mix of materials in Option 2, but I’d LOVE to see you swap out the brass fixtures for black. I’m just kinda over seeing brass in every room (I love it, just feel it’s a little played out – and comes across too bling-y for a mountain house). I was going to comment on the brass! It just doesn’t seem to fit the style as it’s too glam. I’d prefer a black finish as well or maybe a silver tone! I’m curious why you chose to put the toilet in front of the window and not the tub? * ** Just a thought. It may be a good idea to keep the shower, sans bath, in the downstairs bathroom. If the house is rented by families with older members or those with physical disabilities who find it difficult to step over the side of a tub, an easy to enter shower with a downstairs bedroom in a holiday house would be such a special find! Especially if there are plenty of tub options for the kiddos upstairs. Both design options are gorgeous (as usual), but I think you should go wild and explore your dark side. That’s a good point about easy access for the downstairs bath. The older I get the more important it is. I LOVE the black stained wood. And if you are using it in the kitchen, it will tie nicely into the house and not feel like a satellite design. I vote wood floor!!! Option one…and it looks like the overwhelmingly more popular choice! Option two is fine. Just fine. And kinda meh. I read through the first one with furrowed brow, nodding and thinking. 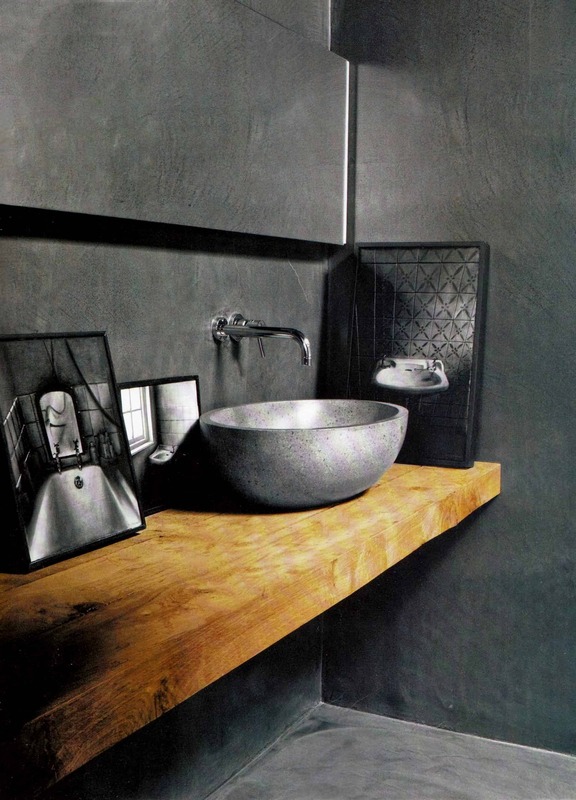 The concrete slab and vessel sink are attractive, if you want to live in a Vermeer painting. On the second one, I relaxed & brightened up from the start. It just feels so nice & refreshing. The dark tile floor is plenty of that flavor for guests. IMHO, guest bathrooms are not a place to be edgy or fashion-forward. They can be very nice a d luxurious if you want, but in a straightforward, nearly bland kind of way, so visitors don’t feel like they’re in the middle of your fantasy. Looking forward to seeing the vanity, and also the post you mentioned about behind-the-mirror storage that doesn’t look medicine cabinet-y. I like the black bathroom….Just concerned about the white vanity! Option 1 but don’t do the white floor!! And small mosaics to boot? 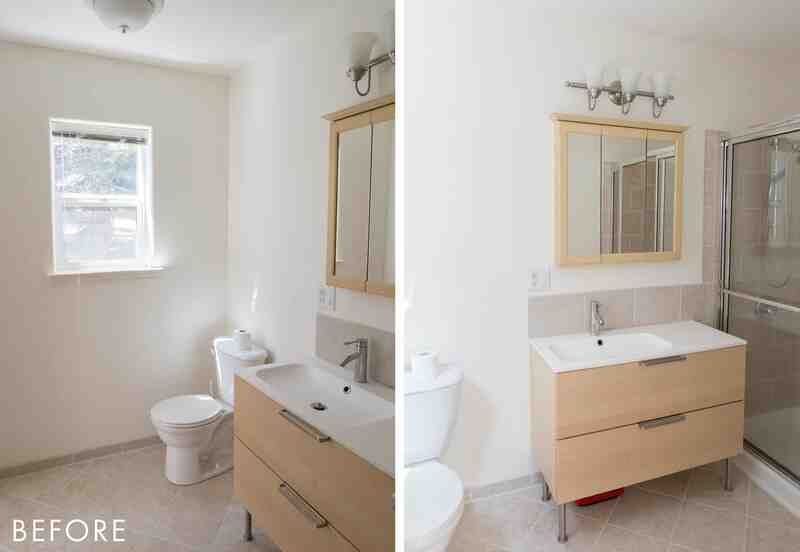 I have two bathrooms with light, small scale tiles and I regret it BIG TIME. option one all the way, the guest bathroom shouldn’t be safe. plus you like it better, you can tell by the way you wrote about it. Option 1. Black bathroom. CAMEL OR MUSTARD VANITY!!! Yes yes yes! All the heart eyes for that combo! Cannot wait to see this one! I have black tile on my guest bathroom floor. Only hit it shows every little thing. But I love it. When I redid the room 8 years ago, black floor tile was not to be found. After almost going with another option, I found some 125 miles away. Success. Go with the black! It’s different, exciting, and I KNOW you can pull it off! Option #1 feels like ski chalet; Option #2 feels like summer lake house. When will this bath be used the most? Black !!!! I dare you !!!! 🙂 Looks awesome !!! Is that squarish black bathtub a Japanese soaking tub? Why can’t it be black reclaimed wood on ONE wall? The other walls could be the lighter wood that matches the vanity (or white). It could be the wall that faces the door, so you get the drama when you walk in, but do not feel overpowered by darkness while inside the bathroom. I think that would be stunning. Option 1 for sure! Love the idea of taking the chance with one of the bathrooms! Definitely Option #1, black walls! I recently moved into an old house with a few walls painted nearly black) I have found that these are the walls that spiders love to hide on and I’ll completely overlook the cobwebs sometimes. I have to examine the wall from strange angles when cleaning now. With this being a tucked away guest bathroom I could see this becoming an issue overtime. 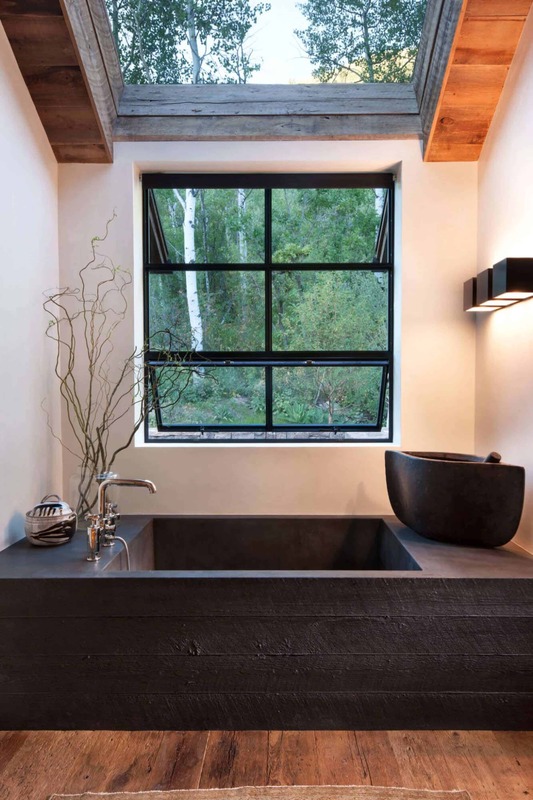 I don’t think this would be an issue around the bathtub though and the black wood clad tub is really stunning! I think No.1 would be beautiful and different than your norm. However, I honestly think doing a 2×2 white tile against your dark walls will make it a stark, sharp space. In all your images, the floor blends into the space a bit more and doesn’t feel so foreign. I highly recommend adding a patterned tile, wood floor or even travertine or limestone to the floor. 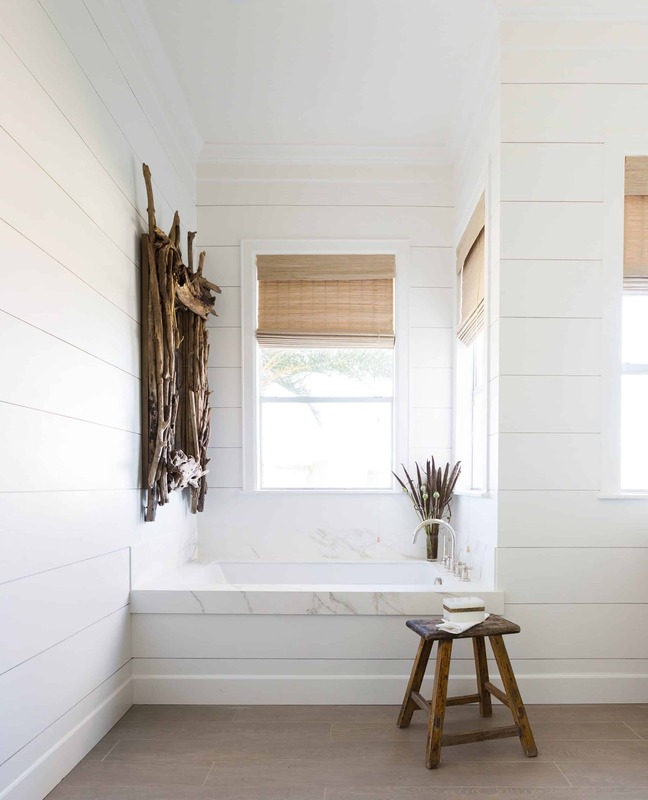 As a commercial designer, I use wood tile all the time on the floor and yes, you can tell the difference if you are in the industry, but it is great for wet spaces and would add some warmth to the space. Or go for a real wood floor as it is only being used in the guest bath and not every day. Either way, I would look at some more options for the floor even though I am sure you have looked at a million, ;)! Can’t wait to see the finished product! I TOTALLY AGREE. After writing the post I decided to at least put a honed marble tile on the floor in warmer tones. the stark white with the black will be cold and too high contrast. Love the dark! It’s something their guests will love and remember!! Black is great! In my last house’s master bathroom I had black slate on walls and floor with a big mirror bouncing the light around. Never regretted it. The bedroom had a hardwood floor stained black as well. I also specified courtesy lights which I had seen in luxe hotels in London…small LEDs set just above the bathroom floor which came on when movement was sensed. Just enough light to find the loo in the middle of the night. I vote for #1, the black version — it’s different — and the materials are so beautiful. In addition to the stained black reclaimed wood, I far prefer the calacatta marble (for counter and floor) to the quartz. It’s going to be beautiful! So much love for #1. If only the vanity could be that unfinished white oak! I’m sure you’ll make it work. I think this bath will be a stunner! I agree! unfinished white oak … but we painted the vanity a dark green today in the rendering and its looking GOOD. We love the black wood. It has a romantic luxury feel that guests will appreciate because when they are staying with you they are on vacation in a way right? Not sure about the contrasting lighter wood around the window, but we know you have a bigger picture we cannot see. It still may feel a little black and white with all the white tile, unless it’s a softer, warmer white. But really, looking at the mood board, it’s going to look smashing. We can’t wait to see it. Black all the way! The light version is nice but kind of boring. A sidebar: When I stayed at the lovely Brentwood Hotel in Saratoga (https://brentwood-hotel.com), the bathroom was black and lovely, but I appreciated that there was vanity space in the (lighter) bedroom for makeup application. Yes to the washed linen shower curtains! I think they are beautiful and I like bathrooms to feel a bit softer and more luxurious. Option 1 for sure! That marble slab is gorgeous—please don’t cut it up into small tiles for the flooring. I feel like it would lose its magic. That said, a marble mosaic (vs the white currently proposed) would be more forgiving with the dirt and sand guests will track in from outdoors. I think ideally the vanity would be wood for warmth, but trust your eye to make it work! I love the tonal whites of the tiles, marble, and shower curtain. They help keep things from going too stark. I’m not sure about the chevron shape, but am loving the handmade look of the tile. Brass seems blingy for a mountain house, but you have this magic ability to juxtapose styles and materials in ways I find so inspiring, so I am excited to see this come together! I LOVE the black stained wood. Like SO SO much. I was so relieved to see it had a handy lead after voting. I do hear what you’re saying about wanting to avoid stark black-and-white, but I’m thinking the oatmeal-colored shower curtain and other textiles could really warm things up. Oh my God, I fell asleep when I got to Option 2. Black stained reclaimed wood all the way!!! anyone else having problems voting? No option to click on. Yes, I wasn’t able to vote either. I only see the % breakdown like I’ve already voted… Not sure why it’s not working for me. Totally love option #1 except for the 2×2 white floor tiles. We are in process of planning to remodel the powder room, so I’m following this one closely! A comment for consideration (based on our own experience) – we have 2×2 white floor tiles in that same room, and even if we were to update everything else, it would not change the fact that there is still so-much-grout and so many crevices to clean on the floors! Option 1!!! That marble…! I’d totally stick with the simpler white floor to let the marble speak for itself. And I’d probably hold the white vanity for one of the many other bathrooms and go with a wood vanity. The design board is amazing! I’ve day dreamed about doing a black bathroom. I’ve seen some that are fabulous. Go for it! So I don’t have to … You’re a designer; you can change it if you hate it. I voted for option 2 because it’s the room I’d rather be in, but really I wish you’d do a mix of one and two. That gold marble needs a space, I’m just not into 4 black walls-too dirty, too dated, too fast! Dark walls – no problem, I have an indigo/navy blue master wall and also an olive green bathroom. The white is much too safe. Experiment with the black but keep it warm and a little rustic. You will figure it out! I really like both, so I don’t think you can go wrong! I do wonder about wood as a tub surround. The one in the inspiration photo looks like cement casting rather than wood to me. I know it won’t be getting the same use as one in your home, but I hope it wears well for you. I voted for 1. I liked the idea of doing the chevron tile in gray, but maybe the white will make the vanity belong more? I’m not sure how you do black walls and a white vanity in a way that doesn’t feel high contrast 🤷‍♀️. What color would you paint the vanity? Option 1, is where it is at!! I love that you are pushing your natural instincts. The black horizontal planks work but when carried into a geometric, antique revision like encaustic tile with some black in it. I don’t think squares work. The black is awesome. Stunning. Brave. I don’t understand using white marble in your rustic cabin??? It seems wrong and also unnecessary when there are so many other stone options available and more appropriate. I said it before in a comment but I think it’s worth repeating- set up some sort of limits and be creative within those boundaries. If you are calling this design rustic, then white marble is off limits. I also disagree slightly about how different the bathrooms should be. My experience in designing whole houses is that it is best to use as much of the same material as possible from one bath to the next and then let art and accessories and layout give the personality. To me, it seems over- decorated to redesign each bath- more amateur, less confident. I love the black! I totally think you should go for it. The only thing that makes me nervous is the wood around the tub. I’d worried about moisture and mold. Number one! So bold yet pretty. I love the warm marble in option 1! If the question is, “Which do you like better?” I would choose Option 1. LOVE IT. But if it were my home, I would go for Option 2 because it would would stand the test of time, even though my reaction is more LIKE IT VERY MUCH. This is so fun. Not something I’ll likely ever do in real life so it’s a real pleasure to pretend. Option one! But instead of mustard, what do you think of a deeper, darker green? There are some beautiful green tones in that gorgeous stone, and green+black+gold looks so lush. I’m really interested to see you pull together Option 1. But I’m also digging Option 2, EXCEPT for the quartzite counter – it’s reading a little 90’s granite to me. Can’t wait to see Option 1 executed! I have tried the last two days to vote for Option 1, but it’s only allowing Option 2 to be highlighted. I desperately want Option 1!! I was watching Grand Designs on Netflix and the episode has been my favorite so far of the 4 seasons they have on Netflix, the episode was in South Cornwall and the homeowners put up stained black oak paneling with texture behind their kitchen wall and it looked amazing!! I looove the black and think you need to trust your instinct and take the plunge! Anything you do would be beautiful BUT I would think about how this room will be used. If this were my house, this guest suite would be my mother’s room when she spends the night. Unless the room has really good lighting and windows and a bigger mirror, she would have a hard time getting ready in that dark bathroom. The dark walls would be wonderful for a powder room. My powder room is BM Kendall Charcoal. A powder room can be a jewel box. No one’s getting ready in there. Just making sure they don’t have spinach in their teeth. Love your blog. First time contributor. This may have been mentioned already and I’m not sure what the vanity looks like but if it has doors or drawers what about replacing the fronts with wood? That would warm up the black room (which I LOOOVE) and be a realitively cheap fix to the stark white of the vanity. I had to go with option 2 but for me personally I would switch the floors in 2 for 1. I get what others you are saying about the moody black walls but I just can’t do black – I find it depressing. I can do navy, or dark green, just not black on a wall. Just a personal preference! Can’t wait to see all these rooms when they are done! I love the first option but not the white vanity. I’d go for a painted option to match the window trim or a color from the marble (which is stunning, btw).